Nothing strikes fear into the hearts and minds of motorcyclists quite like having an electrical failure while on the road. Fortunately, it’s a rare occurrence these days, but it does happen. Although modern bikes’ electrical systems use highly advanced technology, the fundamentals of electrical circuits haven’t really changed. Electricity still flows from negative to positive (depending on who you talk to) and, if there is something in the way that disrupts that path, we have problems. Barring an outright electrical component failure, most on-road problems can be traced to loose connectors or faulty chassis grounds. Often, simple observation and the turn of a good wrench can get you back on the road. 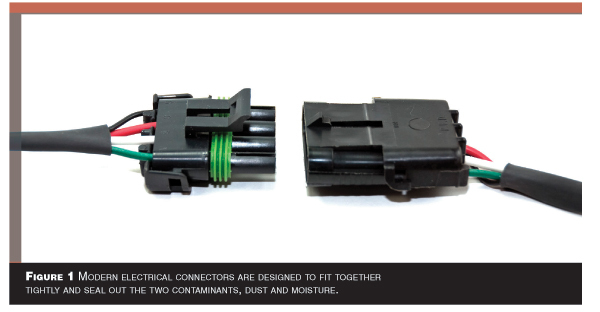 Modern electrical connectors (Figure 1) are designed to fit together tightly and seal out the two contaminants, dust and moisture, that cause oxidation and faulty connections. If, for instance, your headlight flickers intermittently, check the wiring connection to the bulb first, then check all the connectors in the circuit to make sure they fit together properly. A loose connector may have developed oxidation around the contact points. A spritz from a can of WD-40™ will usually clear out the dust and moisture and restore electrical conductivity. Sometimes, we create the very conditions we try to prevent. Avoid getting any water on the electrical system if possible and never use a pressure washer on your bike. Consider that spraying high-pressure water on a wiring harness can flood sensitive connectors and components, which may cause problems down the road. If the wiring and connectors must be cleaned, use a small brush and a spray bottle of cleaner. Lightly spray the area to be cleaned, brush away the dirt, and dry with a soft cloth. Using high pressure air to blow water from the connectors and wiring can have the same effect as using high-pressure water. When performing your usual maintenance, inspect all the connectors to make sure they are in good condition. 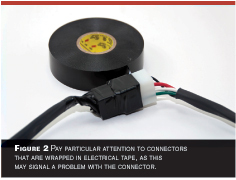 Connectors that appear suspicious may be wrapped in electrical tape (Figure 2) for extra protection. 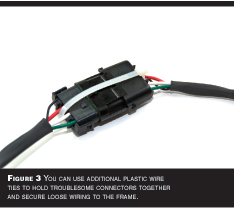 You can use additional plastic wire ties to hold troublesome connectors together (Figure 3) and secure loose wiring to the frame. Chassis grounds are perhaps the worse culprits in faulty electrics. A chassis ground is a point on the bike’s frame where one or more wires are attached to form the negative electrical return to the bike’s battery (Figure 4). The ground wires are usually secured to the frame with a bolt, or screw, and perhaps a washer or two. They usually have little or no protection from the weather, which often results in the bolts and frame forming rust (ferrous metals), corrosion or oxidation that interrupts the flow of electricity. Over time, the bolts can work themselves loose until one or more wires lose continuity with ground and result in an intermittent fault, blown fuse, or a complete failure of one or more electrical circuits. A faulty chassis ground may be difficult to find and appear normal upon first inspection. If you are familiar with a Volt Ohm Meter (VOM) (Figure 5), you can trace out ground circuits to find the fault. A good working knowledge of electrical schematics (circuit diagrams) can really help. However, few of us have such talents. Instead, check the tightness of the bolt. If it appears even somewhat loose, spritz it with WD-40™ and re-tighten. Use care not to over tighten the bolt, which could break the ground wire terminals. If the bolt is very loose, remove it and inspect the frame for oxidation and rust. The frame contact point should be bright, clean and free of paint or any contaminant that could cause a faulty electrical connection. Sand the frame area with #400 wet/dry sandpaper to expose bare metal, then coat the area with a generous film of OX-GARD™ or other anti oxidation product, to prevent further problems. Upon reassembly, a small dot of blue thread lock may prevent the bolt from coming loose again. Once reassembled, coat the chassis ground with more anti oxidant, petroleum jelly or light grease to help waterproof the connection. When confronted with a blown fuse, it is pointless to keep replacing the fuse hoping that the electrical fault corrects itself. Consider that a fuse only blows when excessive current (the amount of electricity measured in amps) flows through the circuit. Excessive current can cause bad things to happen, such as melted wires, fried components, and even fire. If a fuse blows, your first consideration is to do no further harm. Take a moment to analyze the situation. Something in the electrical circuit must have shorted to another component or to ground, causing more electricity to flow than needed. If the bike can be ridden with the dead circuit, such as with dead turn signals, you might consider getting the bike to the closest dealership for repairs. If a critical circuit was affected, inspect the wiring harness for problems, such as loose connectors, cut wiring, or areas where you see damage. If you’ve installed accessories, such as additional lighting, heated riding gear, or entertainment devices, check their wiring first, as a problem installation could be the culprit. Always carry extra fuses for all the circuits on your bike, and never replace a fuse with one rated at a higher amperage. Electrical problems while on the road can be difficult to solve; preventative maintenance is still your best option. 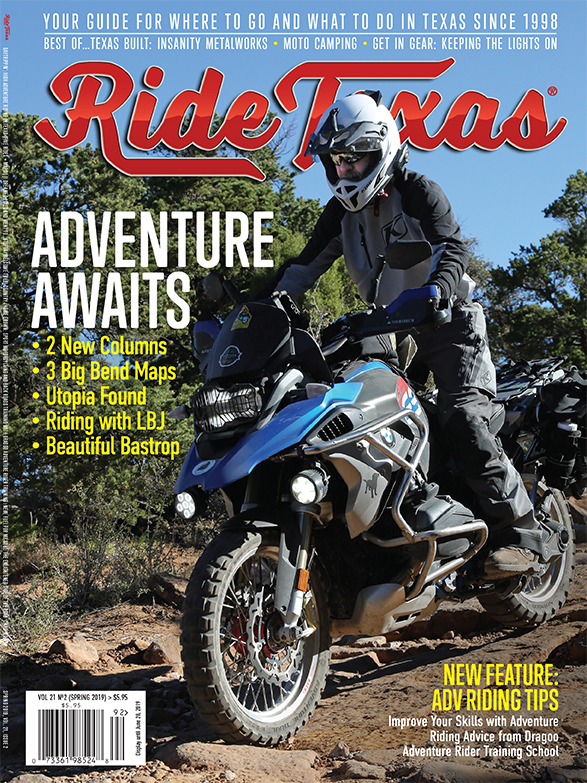 The next time you clean your bike, take a moment to inspect the wiring harness for loose connectors, marginal chassis grounds, and other potential problems. The time you spend now may just save you time spent at the side of the road.